If you love sugar cookies, these gluten free funfetti sugar cookies with funfetti sprinkles will be difficult to resist! Rainbow sprinkles make these gluten free cookies festive for any occasion. Kids love the bright colors and you will love how easy it is to make funfetti cookies! This recipe also makes an incredible chocolate chip cookie too! Keep reading because I made a fun video to show you how easy these cookies are to make! Who says sprinkles are just for kids? Why should they get all of the fun?? Well, it is time to let your inner child out to have some fun. These sprinkle filled sugar cookies are crisp on the edges and they just melt in your mouth once you take a bite. The sprinkles make these that much better :-). Funfetti aka Unicorn Food is a fun way to add some color to your baking. I am taking the high road and not calling these cookies unicorn food because my teen daughter will rebel against them! Cookies don’t get any better than these gluten free funfetti “unicorn cookies”. My daughter has been asking for gluten free cookies lately…but not any gluten free funfetti cookies. She wanted something more girly. I have to admit, I was thrown for a loop over this request. My daughter is not the pink sparkly girly type. Do you think cookies can be girly? Do you want to know a special bonus about these cookies? They are filled with almond flour. A full cup of finely ground almond flour. Sneaking some protein into these cookies, which I love to do to, helps balance out the sugars. Just in case you are laughing at my new Wifey coffee mug, there is a story behind it. Mr. Fearless Dining is always stealing my coffee. Our mugs mostly are the same, and he “claims” he can’t tell whose cup of coffee when a mug is on the counter. Anyways, I found these Wifey and Hubby mugs at Target last week…and problem solved! He would definitely be caught red-handed if he is holding my Wifey mug! Funfetti sprinkles can come in many different colors, by many different brands. You can choose rainbow brights, pastels, or even shades of the same color. These sprinkles can come in lines like what I have, circles, and other shapes. You can buy regular sprinkles or natural sprinkles that don’t use food dyes. These funfetti cookies are soft and delicious…but just a tiny bit crispy on the ends. 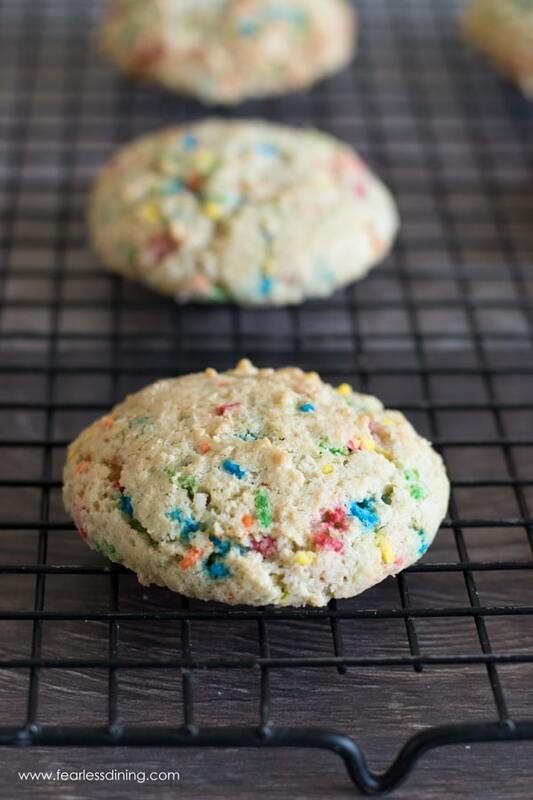 It is so easy to make funfetti cookies from scratch, just grab your favorite rainbow sprinkles! Add the dry ingredients to a bowl and whisk to blend thoroughly. Feel free to substitute coconut sugar for the regular sugar. Just note the color of the cookies will be more brownish. Add the eggs, melted butter, and vanilla to a bowl and whisk to blend. Whip until it is well blended. Add the rainbow sprinkles and mix the wet and dry ingredients together. Use a cookie scoop to drop the cookie dough balls onto a parchment paper lined baking sheet. Bake at 350F Degrees for 8-10 minutes. Remove to a cooling rack to cool. Here is the video to tie it all together! Come see all of the gluten free cookie recipes on this blog here! My favorite gluten free cookies for a cookie exchange party. Super cookie sheet. This makes baking cookies so easy. This cookie scoop is awesome because it ensures your cookies are all the same size! In a mixer, add all of the wet ingredients and mix on low until blended. Slowly add the dry ingredients to the mixer, keeping the speed on slow. Add the sprinkles to the mixer. Drop spoonfuls of cookie onto the baking sheet. Remove from the oven and move the cookies to a cooling rack. If you love sugar cookies, here are a few more to try out! what a fun and pretty cookie for Easter! These fun fetti cookies look delightful, Sandi and I love that they are gluten-free! Oh God, what a tasty looking this FUNFETTI COOKIES is! I am in love with the colors and how simple and short the ingredient list is. Yum! Almond flour is fun, it adds a nice burst of protein too! It’s hard to believe these funfetti cookies are gluten free. They look so yummy! They look like they have the most wonderful texture, so colourful too. I’d say these definitely look “girly” 🙂 And though no one in my family needs to be gluten free I like the idea of adding protein to a sugary treat! Great recipe. I had no idea until my step-mother was proscribed a gluten-free diet just how many medical reasons there are to go gluten free (beyond Celiac disease). This looks like a fantastic recipe she could make and actually enjoy with her grandkids. Thanks so much for sharing! I am so glad Leslie. Gluten can manifest in so many ways, mostly inflammation, but our family has found so many issues were really caused by gluten. I like how simple and easy this recipe is. Kids would love it. You are so sweet Traci, thank you :-). I think sprinkles can totally be girly! I love anything with sprinkles and funfetti is so fun, too. I’ll have to make these for my GF friends! How cute that your daughter requested “girly” cookies! These sure are pretty, but I definitely thinking my son would gobble them, too! 😀 I mean really – who wouldn’t love them?!? So great that they have the added protein, too, and that they’re gluten-free so the kiddos can share them, even with friends who have to avoid gluten! Fantastic! I am going to make these cookies for my GF sister!